Growing up my mom would either make white rice or what I used to call ” sticky rice”. She would make that “sticky rice” in many flavors. She would make it with curry, onion, parmesan, tomato… I really was not fond of that type of rice then. All i wanted was boiled white rice with a ton of butter and fresh Emmenthal… Yummm!!! Today i love that “sticky rice”. In fact, I would rather “sticky rice” than that plain white rice au naturel. Well, it took me many years to figure out that what she cooked all along was risotto. Isn’t it funny??? 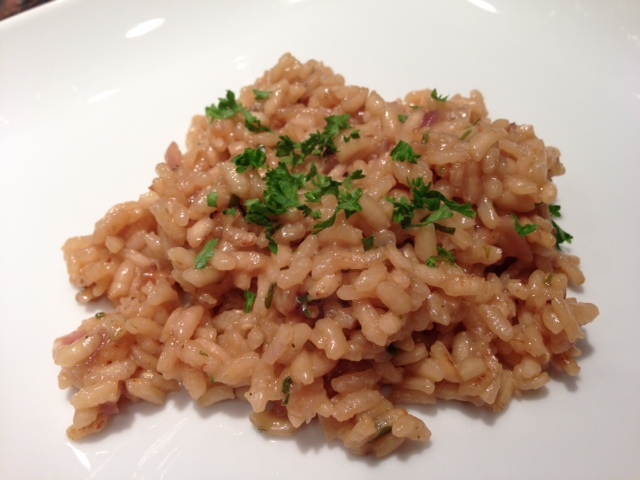 Today I will present you the recipe of parsley and onion risotto. It is yummy, easy to fix, and can accompany many meats or fish. I served it with herb coated pork tenderloin. In a medium-sized pot, warm up the olive oil so it is hot. When the oil is hot, add the onion and saute them. Lower the temperature to medium/ low and continue cooking the onions until they are a light brown yellow and are soft. Then add the rice, the chopped parsley and stir to coat with the olive oil. Pour 2 cup of hot broth over the rice and stir. Bring the mixture to boil, and when it has come to boil, lower the temperature and cook at a low temperature. Stir often. When the broth is all gone, add more and stir. Cook until the rice is al dente. When the rice is to your liking, add 2 tbsp. of butter, or 2 tbsp of mascapone, 1/2 cup of parmesan. Et voila!!! You eat it by itself or with a meat.